FRP double-wall tanks are usually filled with monitoring fluid in theinterstice . Normally, the monitoring fluid level should keep in the middle of the reservoir which is on the top of the tank . ACCU provides HLS-1D dual-point hydrostatic sensor which can accurately detect fluid-level changes in reservoir in high or low level change . If the brine solution seeps into the tank , lowering the level in the reservoir , the sensor triggers a low-level alarm . 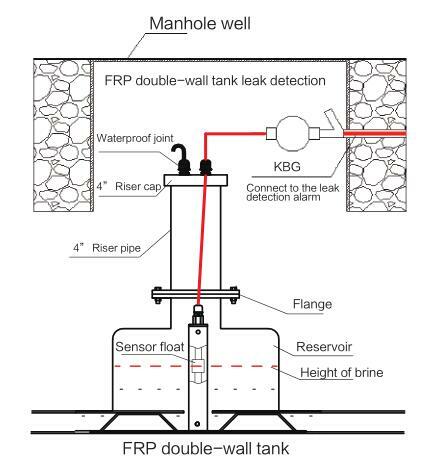 If an outer wall leak occurs and groundwater seeps into the tank , a high alarm is activated .